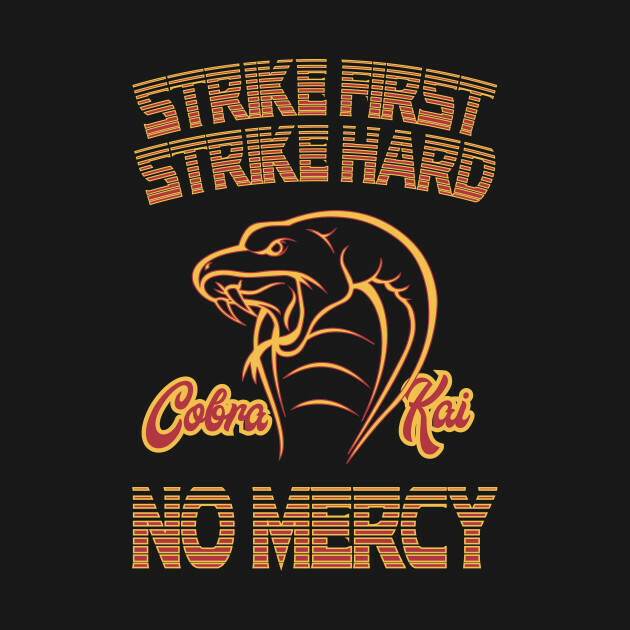 The title of this post comes from part of the motto of the Cobra Kai school from The Karate Kid movie. Cobra Kai is now a series on YouTube. * Yes, after 34 years, Daniel-san and bad guy Johnny ("Sweep The Leg") are back! These guys are in their fifties now, and they're still at it. Fifty is the new thirty-five. 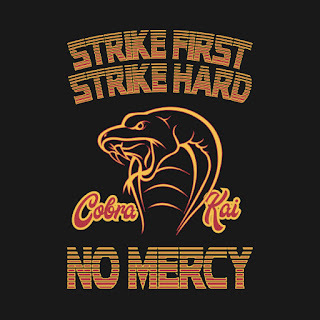 I'm pretty sure Johnny is still hawking "Strike First, Strike Hard, No Mercy" at his new Cobra Kai school. This idea is diametrically opposed, deliberately I assume, to one of the most fundamental tenets found in karate, among other styles. But the Cobra Kai "Strike First" stance takes no prisoners. "Strike Hard" is a no-brainer, I suppose. "Mercy is for the weak" is dysfunctional; roles can be reversed. What goes around, comes around. In 1938, Gichin Funakoshi put forth 20 precepts for karate students to train and live by. His Twenty Guiding Principles of Karate contains the famous excerpt karate ni sente nashi, or "There is no first strike in karate." This basically implies that you don't provoke a fight; it does not mean that in the midst of what looks like a potential altercation — after all other options have failed — you wait to get laid out on the sidewalk. Deescalation isn't always available. Unprovoked attacks and sucker punches happen. If you're lucky enough to factor in time and distance, then reading intent or energy (shin or ki) is possible. Go no sen. This means "after the attack." A basic example would be an aggressor steps in with a punch, you block and counter with a strike. Sen no sen. This is "before the attack." An aggressor announces he wants to kill you, and without hesitation you strike. This is like the old military aphorism "The best defense is a good offense." It's easy to see how both of these concepts can be misconstrued. Waiting for an attack with the sole purpose for a counter and strike is a recipe for disaster. And the legal ramifications of kicking someone in the head because he flips you off should be obvious. These concepts are not exclusive to karate, and there are more no sen principles in other arts, such as Kendo and Aikido. These strategies go into much greater depth than I describe. For a deeper study into these principles dealing with situational assessment in actual combat, check out The Book of Five Rings by the Japanese swordsman Miyamoto Musashi (c. 1645). * This is only on YouTube's new "premium" channel. So yes, that means it ain't free. It's either a monthly rate, or pay-per-view.